Apple crushed a big problem when it released the AirPods. Companies had been trying—and failing—to build truly wireless earbuds for years. But then Apple showed up and was like, “Here they are!” Now, it’s Bose’s turn. The new SoundSport Free wireless earbuds are sleek, powerful, and dependable. The Bose buds can do things that the AirPods can’t. They’re also $250. Put that price out of your head for a second, and imagine what you’d want out of a set of completely wireless earbuds. For me, the number one thing is connectivity. If the earbuds struggle to stay connected to your device or to each other, they’re basically worthless. (The dependable Bluetooth connection of the AirPods, thanks to Apple’s proprietary W1 chip, is a big reason those wireless earbuds are successful.) A close second to good Bluetooth performance is a great fit. If the earbuds don’t stay in your ears, why bother? And finally, there’s the classic headphone stuff: sound quality, usability, and durability. The Bose SoundSport Free wireless earbuds check all of these boxes. They connect flawlessly and dependably. They fit like a dream. They also work like a dream thanks to impressive audio fidelity and a seamless user experience. The hardware is impressive too. While Apple’s AirPods look like someone just cut the cords off of the wired Apple earbuds, the new Bose headphones look like little spaceships. There’s a flying saucer sort of shape on the outside of the bud that holds all of the electronic guts and batteries. It’s a little larger than a quarter, which seems big until you realize that the earbuds weigh almost nothing. On top of that disk there are four buttons—three on the right earbud to control volume and playback as well as one on the left earbud to control the Bluetooth connection. On the back side, there’s a rubber sport tip with a fin that keeps the earbud in place. As the name implies, the SoundSport Free earbuds are designed with exercise in mind. That means extra attention has been paid to the fit. The earbuds come with three sizes of sport tips, though they fit my ears perfectly right out of the box. Once the earbud is in your ear, you’ll forget it’s there. Putting them in is easy, without any weird head twisting or installing hooks around your ears. And, I swear to God, I couldn’t get them to fall out during every day use or on runs. Also good for sports is the fact that the earbuds have an IPX4 waterproof rating. So no need to worry about sweat or rain. You also shouldn’t need to worry about battery life. The SoundSport Free buds offer five hours of playback on a full charge and come with a charging case that holds enough juice for two more full charges. A quick charge feature gives you 45 minutes of juice after 15 minutes in the charging case. The whole package looks like an alien invasion, right? All of these specs are impressive, but they’re also comparable to the latest completely wireless earbuds from Apple, Jaybird, and Sony. 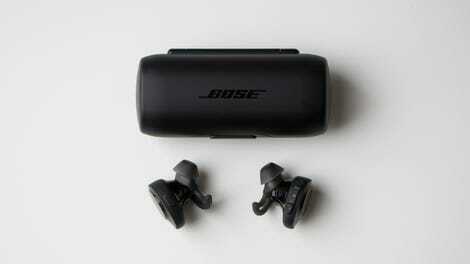 What sets the Bose apart is the fact that the SoundSport Free package keep its promises. Like I said above, connectivity is a big one for me. Having tested wireless headphones for half a decade, I can confidently say that bigger Bluetooth devices, like over-ear headphones, are almost all dependable on this front. Smaller devices, like truly wireless earbuds, seem like they’re never dependable. So I was blown away to find that the SoundSport Free wireless earbuds enjoyed the same rock solid connectivity as the Bose QuietComfort 35 over-ear headphones. I first tested the QC35s a year ago and am currently testing the second generation of these noise-cancelling beasts. Among other things, they’re excellent wireless headphones, because you never need to connect. You turn the headphones on, and they pick up the nearest previously paired item. The sport tip is easily replaced or swapped for a different size, while the earbud features a very fine screen to keep out dust and water. The SoundSport Free earbuds do the same thing. Every time I took them out of the charging case and pressed the play button, they’d pick up where I left off on my podcast or music. You can also use each earbud independently which is good for calls or spatial awareness. A single tap of the Bluetooth button will bring the second earbud into the mix. (Switching from one device to another is slightly more complicated, but it’s still easier than any other wireless headphones I’ve tested, even Beats wireless and Apple AirPods.) The SoundSport Free buds also stay connected to each other almost flawlessly. I did notice a little trouble with interference in signal-heavy areas like Union Square in downtown Manhattan, though that’s pretty typical. One minor gripe with design is the tactility of the controls. The buttons are honestly just a little bit too hard to press, and on the right earbud, the multifunction button in between the up-and-down volume buttons is especially challenging. My fat fingers struggled to play and pause my music causing the earbud to careen a little bit, though it never actually fell out of my ear. It’s possible that these buttons will loosen up over time, which is why I qualify it as a minor gripe. Like I said, the flying saucer part of the earbuds is slightly larger than a quarter. This brings us to the classic headphone stuff, like sound quality. With this entirely new category of headphones, sound quality almost feels like an afterthought. If wireless earbuds don’t connect or don’t fit, you’ll be too annoyed to use them even if they do sound great. As it were, the new truly wireless Bose earbuds do sound great. The audio fidelity is very Bose, with very well balanced tuning that doesn’t sound too bass-y or too shrill. You can distinguish each distinct vocal track in “Crossroads” by Bone Thugz-N-Harmony, for instance, but you’re not going to feel the kick drum. The high pitch synths in “Jealous (I Ain’t With It)” by Chromeo sound crisp, but the bass guitar is hard to find. Still, the sound quality is versatile and agreeable. The sound, however, is not very loud, and there’s no noise cancellation. I wouldn’t even describe the Bose SoundSport Free as noise isolating headphones, as the sport tips sit on the outside of the ear canal without creating a firm seal to keep out ambient sound. This is a feature when you’re running on a quiet trail or just walking down the street. You’re not blocking out the outside world, and you’re getting a good audio experience. But if you’re in a noisy gym or on the subway trying to hear every note of the new Liam Gallagher album, the experience might be a bit frustrating. The charging case is bigger than the one that comes with the AirPods, but it’s still small enough to fit in your pocket. If you haven’t figured it out by now, I really like the Bose SoundSport Free earbuds. They’re a good gadget, one that stands apart from its competitors. In a lot of ways, the Bose headphones remind me of the Jaybird Run ($180), another set of truly wireless earbuds that I tested earlier this year. The big difference: the Bose buds work without constant connectivity problems. Meanwhile, the Apple AirPods are the obvious comparison for this category. The AirPods ($160) aren’t designed for exercise, though, and they aren’t waterproof. The sleek Apple design, although attractive, also offers very limited controls. You have to beckon Siri to turn the volume up or down. This do-it-all approach might be a reason why the Bose earbuds are so much more expensive. For $250, you get the dependability, the fit, and the great sound quality you need in any set of headphones. Perhaps just as valuable, for some people, is that Bose logo on the side. The company still enjoys a loyal customer base, so it’s hard to put a price on the brand cachet. Still, as much as I love the SoundSport Free earbuds, the price tag feels too high for now. Sony, for instance, recently announced its own set of truly wireless earbuds with noise-cancelling that cost just $200, and competition in this category will only get fiercer. 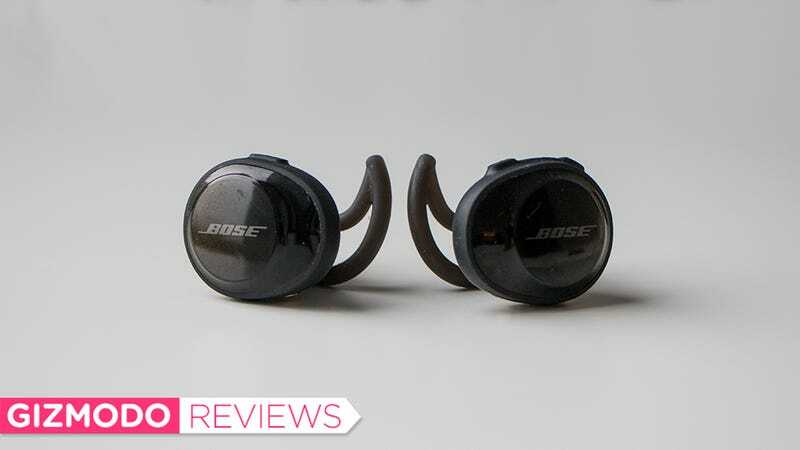 For now, the Bose are better than AirPods and the rest of the wireless earbud pack. But who knows how long that status will last.